What to Make of Air Compressor Horsepower HP Rating? My Air Compressor CFM Is Not Stable – Please Help! Which Air Compressor is Best for Home Use? Air Compressor Power Issues for International Buyers? There Are So Many Different Types of Air Compressors – Which One Should I Buy? I am sure that by now, we know what air compressors are – i.e. if you have been following up with our best air compressor reviews at Power Tool Buzz. Among other things, yes, they can be used to operate a nail gun or inflate a tire. However, the scope of a good quality air compressor goes way beyond inflating tires and putting the compressor’s services to other fruitful alternatives. I am not talking about a particular company brand, or one air compressor specifically. This “problem” applies to these power tools in general. It is the age old myth that air compressors are only good for blowing up things. Tires, to be exact. Since childhood, I am used to see air compressors at mechanic shops – especially around the area where they repair tires. Same goes for bicycles and every other jumping castle hangout where powerful air compressors are used to fill those inflatable fantasies to perfection. In reality, air compressors are able to help quintuple the output of construction standard impact hammers, air wrenches, high PSI nail guns, sealants and vice versa. 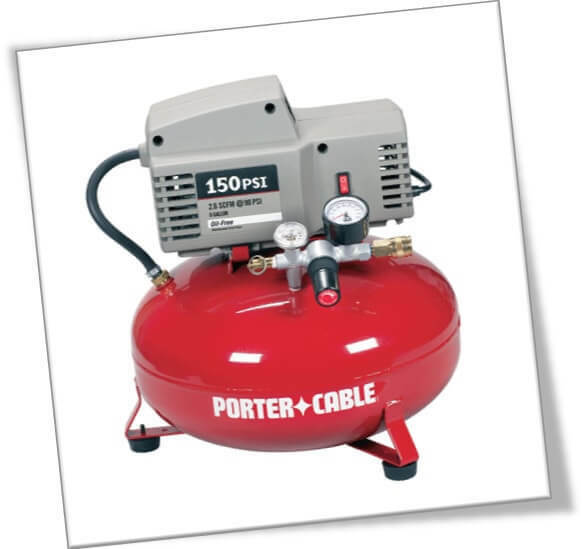 As a matter of fact, most cosmetic shops have been using a low range variety of cheap air compressors, such as Porter Cable ACs to use on spray pain guns. Another main problem with buying an air compressor for the first time is not having an idea about the basics. What is PSI? How much air compressor horsepower do I need? Is the amount of CFM (cubic feet per minute) more than enough to operate a simple air paint gun? This dilemma is interrelated with requirements. Many people, who buy an air compressor for the first time, have no idea what their requirements are. They “assume” that buying a high priced dual tank air compressor such as the Campbell Hausfeld DC040500 or some other brand will fulfill the long list of purposes, but in reality it only goes as far as ground level contractor work. The starter models of air compressors come with either 0.5 or 1 HP. As the price goes up, so does the HP level. I have seen good ones with a massive 6.5 HP – and these are the kinds of air compressors that can easily handle industrial scale uses. The PSI on a 6.5 horsepower air compressor is also higher, but so does the noise level. Okay, so if you are interested in buying an air compressor with high HP rating, you should know that it will have one major side effect – and that is the noise level. Higher performance air compressors have a shrieking noise scale. It is the kind of noise that is too high for naked ears, or it is high enough to the point where you cannot hear the next guy at the work site. While it is true that HP is a valuable factor for determining the air compressor’s performance, there is CFM rating too. As stated earlier, CFM is the abbreviated form of cubic feet per minute. Just think of it as the compressor’s speed to fill up one cubic feet of area within one minute. The faster it is, you know that it is better that way. I have read far too many times where people say that their air compressor CFM is not stable. Yes, you will also experience this “issue” no matter which air compressor you buy from the local or online market. CFM is a measure of volumetric flow – it is how fast the air fills up in the air compressor tank, or the object which you are inflating. The ironic thing is that CFM changes whenever the PSI of the air compressor changes. The two are entirely different things, but PSI rate determines the overall pressure of the combined air. PSI is at its optimal levels when the air compressor is full; therefore, when the PSI is at max level, the CFM will also be high. As a result, you will notice that the air compressor is working extra fast. The CFM scale on an air compressor is supposed to be pegged on the same levels as the PSI. However, if you are still confused, go for an air compressor with SCFM instead of normal CFM. The “S” stands for Standard, which is the industry’s common derivative for air compressors that follow a preset CFM scale. To help make this an easy decision for you, ask for Standard CFM air compressor. If the vendor is not just an ordinary sales guy, he will assist you in selecting a suitable air compressor. The SCFM levels are parallel to 14.5 PSIA – and that too at 20 degree centigrade temperature. This explains why the manufacturers label their air compressor boxes with 0% residue/ humidity/ leakage thing. Side Tip: If you are a contractor, or someone who is familiar with air tools, then check the box packaging of those items. 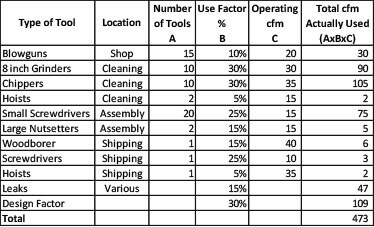 Each one of the power tools is supposed to mention its own individual CFM level. So let's say you have couple of air tools; you need to add up their CFM and see which number comes up. If it’s 2.5 or 3, then it means that you need to buy an air compressor with at least the same or equivalent CFM as the combined CFM of your air tools. The above example was just from layman’s perspective. In reality, the CFM is much higher. Add all the CFM and you are going to end up with a cumulative 19.5 CFM. This means that you need an air compressor powerful enough to handle that much amount of CFM. 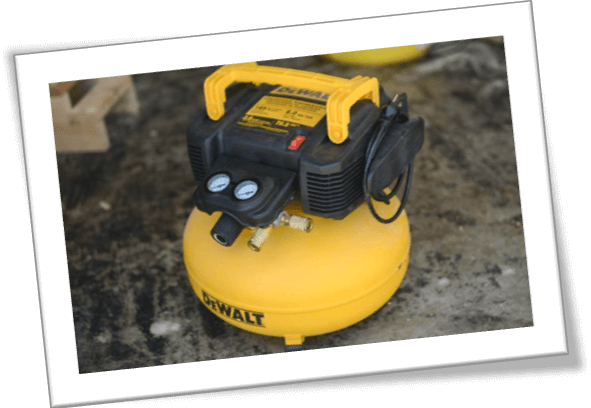 Some people buy midrange air compressors, such as those models from California Air 2075A or a Dewalt DWFP55126 to satiate their needs. In that case, they only use 2 air nailers or one air nailer and one paint gun simultaneously so as not to put too much pressure on the air compressor itself. This question is purely within the confines of space and portability. Over the last few weeks, where I have reviewed different air compressors at PowerToolBuzz, I emphasized a lot on their weight or the portability factor. For instance, the Makita Mac5200 Big Bore air compressor rides on two rear tires and a handle on the front side. Although this air compressor is way too heavy to be lifted single handedly, you can pull it across any kind of terrain, up or down the stairs or from one job site to another. The tires have a solid build quality, which is why they seldom wear off or anything like that. If your air compressor does not have base wheels, then it should be light enough for you to lift. Pancake air compressors are small in size, such as; Bostitch Air Compressor BTFP02012 – this one comes with a fat belly style body and has rubber grips at the bottom. By default, the air compressor’s weight is not that much; maybe around 15 Kgs. One thing which people often overlook within the portability factor limit is how effective is the said air compressor when combined with other air tools. Everything is scrambled over construction sites. You may have your air compressor sitting in on the first floor, while the nailer guy is working on the second floor right above you. In this context, does the air compressor hose extend to the second floor? Does the extension power cord go beyond several rooms to the main power socket? These questions need to be accounted for when buying an air compressor. 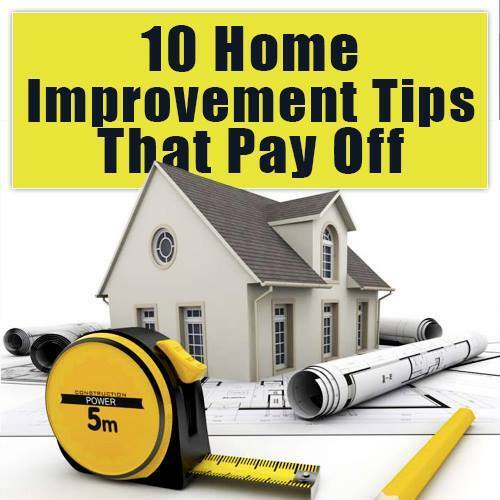 Especially, if you are a DIY enthusiast or a home based user, you’d want the air compressor hose and the power cable to be long enough to reach the roof top. Most of the latest air compressors that are available at Amazon, eBay and the retailers’ own website, are U.S. power operated. It means that they will run at 110V, unless and until it is explicitly specified. The good thing is that U.S. based air compressor users will not have any issues related to voltage rating, but if a guy is in Asia, he may have a serious problem at hands. The South Asian market power tools operate at 220V. If you are buying an air compressor from an international US website, and then forwarding it to your country via a mail forwarder company, then you need to make sure that there is a step down voltage converter available at your local electronics shack. These converters reduce the 220V to 110V so that when the air compressor switch is plugged into the converter, which then goes to the main power source socket, there would be no issues. Ignoring this little workaround solution is not an option because as soon as you will plug in any 110V US electronic item into a traditional 220V power socket, the item in question will instantly burn. I once made the mistake of importing an LG Blu-Ray player from the US. As soon as I plugged it into the power socket, the player LED light blinked, followed by a pop sound and some smoke. The repair guy told me that the warranty is voided in case of such burn issues – and that I should have used a converter instead of the other way around. Again, this question is related to what kind of work you are looking to do with your air compressor. If you are just an ordinary camper, you should buy a small pancake air compressor, which should be compact enough to fit inside the storage cabinet by the side of the camper vehicle. Otherwise, home based work sites are more suited to stationary air compressors because they are large and should be sitting in at one side of the area where you work. The high horsepower models are mostly stationary because of the added weight that comes as a result of more storage capacity and an occasional extra tank. Pancake Air Compressor: These are the ones which have the usual flat belly. You can’t miss it. The look is adorable. A nice example of a pancake air compressor would be the Bostitch Air Compressor BTFP02012 as its design adds stability and allows the unit to cover less space, while being able to store more air. Hot Dog Air Compressor: A good example of a hot dog air compressor would be the Quiet Air Campbell Hausfeld series air compressors. It is because of the fact that the compressor tanks are not only in cylindrical shape, but their orientation is horizontal. 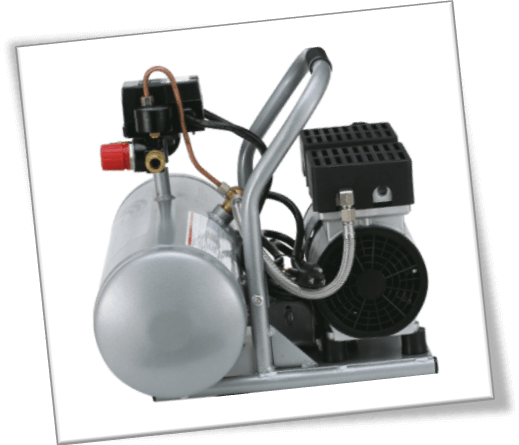 Hot Dog Air Compressor units come with a single or multiple tanks mounted on top of one another. California Air Tools 2075A and 2010A are also fine examples of Hot Dog air compressors. Wheelbarrow Air Compressor: Just as the name suggests, this type of air compressor sits on two tires attached to the base, while there’s a handle on the side opposite of the tires to help take the unit from one place to another. For the record, I did mention a thing or two about wheelbarrow air compressors at the start of this air compressor buying guide 2019. You can scroll up to the appropriate section to get a gist of it. Word of Advice: This is specifically for first timers; those who have never owned, used or been near an air compressor before. These units are powerful and when used in the wrong way, there is a probability of bodily damage. In worst case scenarios, you can blow your ear drums if you are using a heavy duty industrial level air compressor without appropriate safety gear. The best bet would be to read the air compressor instructions manual to get a grip on what kind of features you are up against. A friend of mine made the mistake of leaving the air compressor on throughout the night. It doesn’t take that long for the tank to reach full capacity – at which point you are supposed to turn it off. So, in case you leave it at On, the air compressor will let out a really loud ear popping noise to indicate that the tank is full and excess amount of air is being leaked to normalize the PSI. Don’t worry, this is more of an auto balance feature, or a fail-safe system so that the tank doesn’t blast. However, the noise can really rattle up the entire neighborhood in the middle of the night! If you have bought an air compressor already, I am sure there are couple of features that you need to know about. The most important feature is the “Oil Free Pump” label that’s printed on almost every modern model of air compressors these days. Basically, the oil free pump helps to reduce the maintenance factor and prevents any oil residue from mixing into the compressed air inside the tank. Many years ago, air compressors used to have an oil based model – it was common, but soon got replaced by oil-less pumps. While oil helps the air compressor pistons to lubricate and work at maximum level, its leakage can cause damage to the air compressor itself. Besides, leaking oil also leaves an ugly mess on the tank and anywhere on the ground where the unit itself is seated. So, the oil less version of air compressor means you don’t have to worry about any leakages or repairs associated with such incidents. Oil is replaced by Teflon, which can wear out over prolonged use. As a result, the pistons inside the air compressor pump can dry, and they will have a hard time pumping air. Friction will be more, hence causing the heat levels to increase exponentially. Multiple Couplers: The couplers are connecting ports that help you to handle different tasks on an air compressor at the same time. Remember that part where I talked about using 2 nail guns or one nail gun and a paint gun at the same time, that’s where couplers come in. 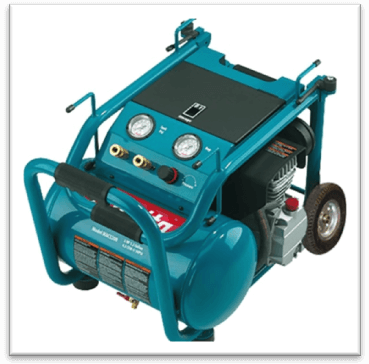 Included Accessories: Most of the air compressors come with extra accessories, such as; hoses, connection points, blow guns, nailers etc. These accessories add value to the overall purchase experience. However some shady manufacturers create low quality accessories, which eventually result in repurchasing alternative pieces from other reliable online sources. The most important thing about air compressors is their warranty period. Some companies have an extended warranty place that you can buy on top of base purchase. Likewise, some companies have 1 year warranty, but their customer support is so poor that they take months to respond and find a replacement for you. Therefore, if you are looking to buy an air compressor in 2019, make sure that you have done some background research on the air compressor company. The best way to do so it to communicate with other people at air compressor forums, or read a best air compressor review on the internet.